Hello everyone. Will here. 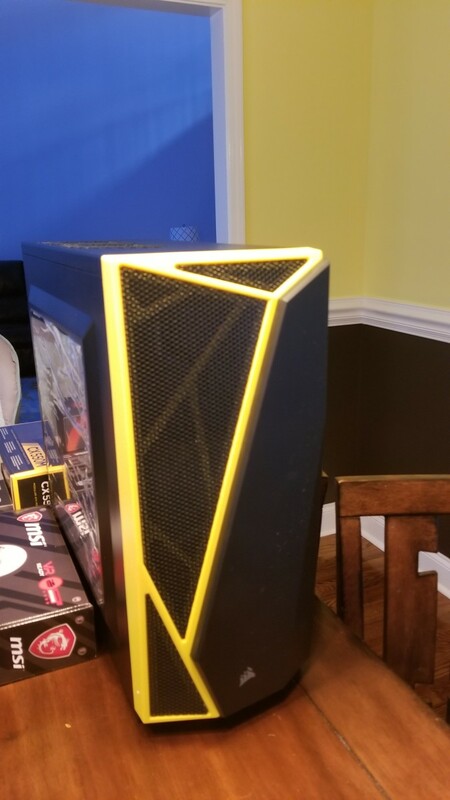 Today, I am going to be sharing a Ryzen 3 PC build I just completed that I like to call Bumblebee. I built this computer for my daughter as a Christmas present for this upcoming Christmas season. 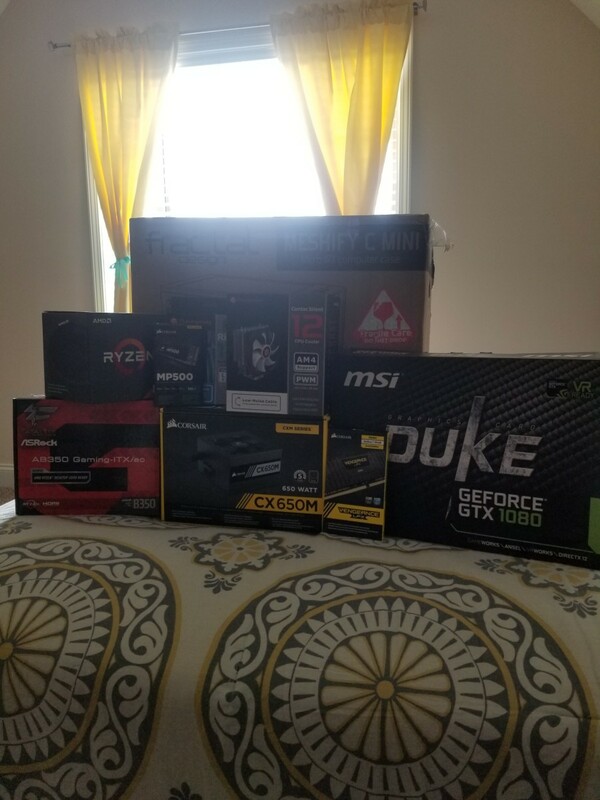 This is a PC build I’ve been wanting to do for some time now, especially since the Ryzen chips came out. 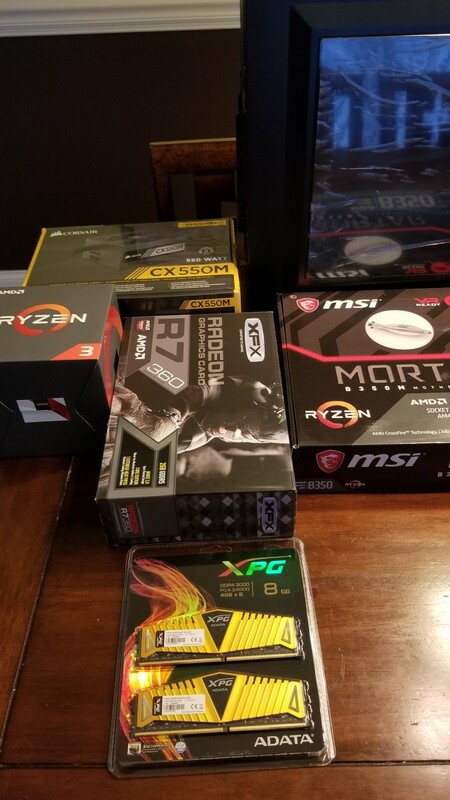 When I was planning my personal gaming PC build, I was initially wanting a Ryzen 5 1600 but chose against it as it was still relatively new in the CPU market and I’m not real big on being one of the first to try a new line of anything in PC parts. Now, after spending a few days with this PC with benchmarking and doing some light gaming on it, I must say I’m somewhat disappointed in my Intel decision. However, this processor in no way will ever compete with the Intel i7 7700k processor that is currently in my personal PC. 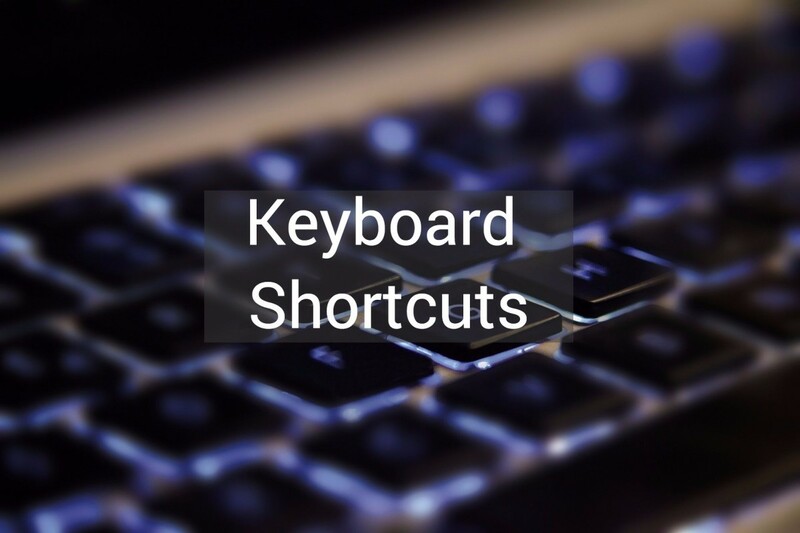 Without going more in depth on that PC, you can check out its specifications in my article, “Back into Hubpages with Budget PC Build.” That article is a little outdated now and I will be updating it in the very near future. So, let’s talk about what is under the hood of the Ryzen 3 PC. Obviously, at the brain center to this budget PC is the Ryzen 3 1200 processor. 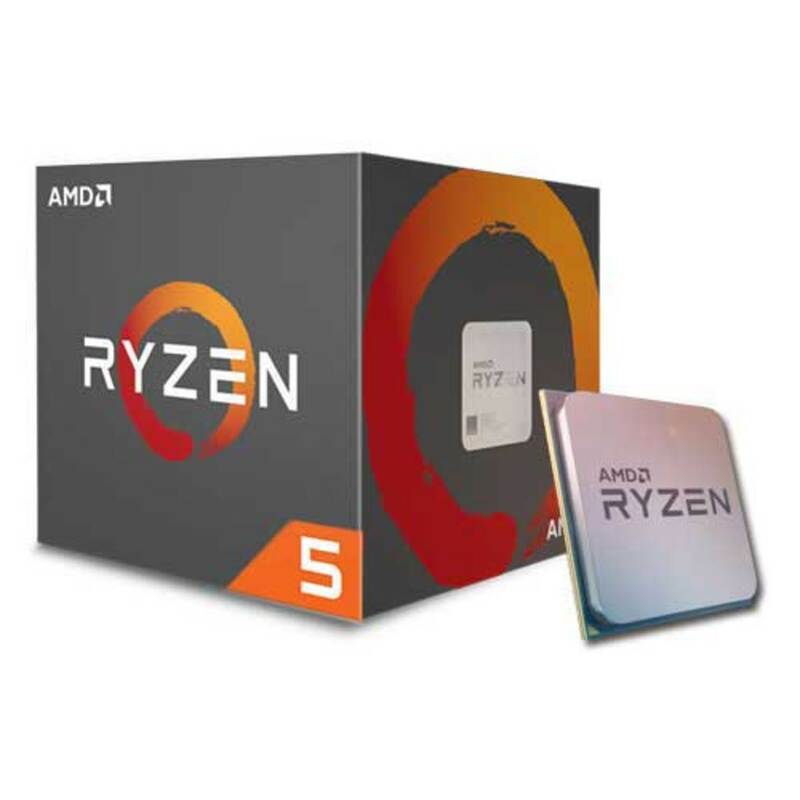 The Ryzen 3 1200 is a quad core processor with 4 cores and 4 threads and is clocked at 3.1GHz on the base clock and a max turbo core speed clock at 3.4GHz. The entire Ryzen line of processors are capable of overclocking so, you can push this particular processor to around 3.7GHz on the stock cooler that comes with the processor. Personally, in this build, I have gotten the processor to 3.75GHz on the Wraith Stealth cooler with idle temperatures around 32C and temperatures at load reaching around 75C. In the future, I will most likely replace the stock cooler with an aftermarket cooler to try and push this CPU to around 3.8GHz or 3.9GHz. This processor sports a total L3 cache of 8MB, 384KB of L1 cache, and 2MB of L2 cache. This processor sports 14nm architecture and fits into the AM4 socket platform. The max power draw is 65w and the maximum safe temperatures are 95C. Per AMD’s website, the processor supports 2667MHz DDR4 RAM speed in dual channel configuration. The processor launched on July 27, 2017 at an MSRP of $109. I was able to get this processor brand new from newegg, after a sale and instant rebate for $95. Discover the new Ryzen™ 3 1200 processor, featuring 4 cores and delivering true quad core performance for gaming, and computing. 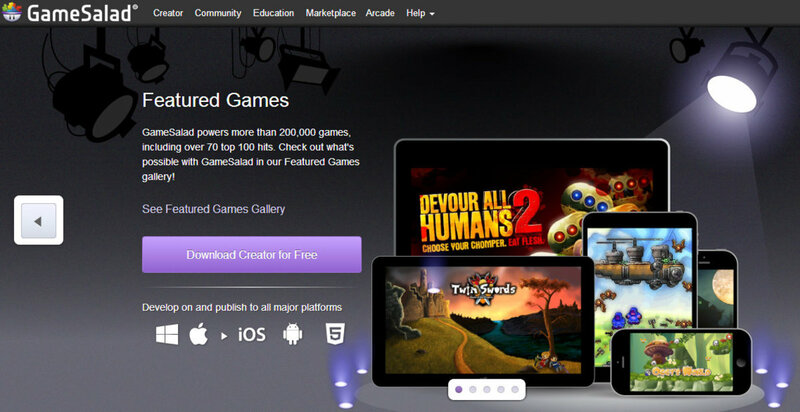 Visit AMD.com to know more! Speaking of RAM, in the Bumblebee, I went with the ADATA XPG 3000MHz DDR4 RAM but it is running in this system at 2667MHz because as you see above, maximum supported speeds are 2667MHz of DDR4 RAM. I went this RAM for looks really and that’s it. 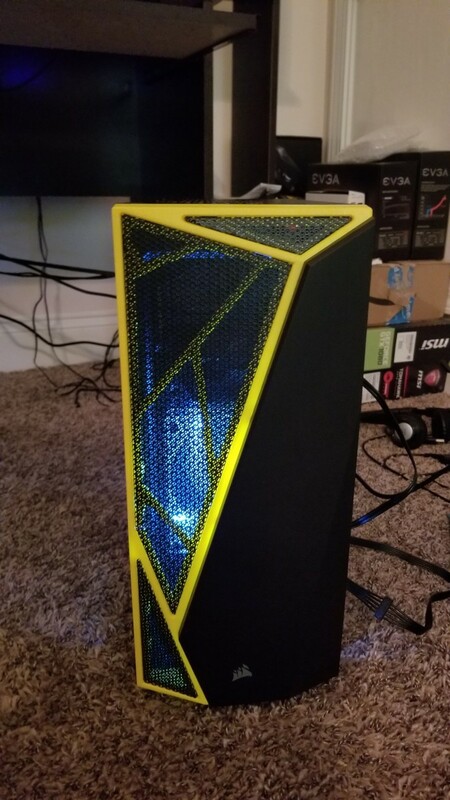 It was the only RAM I could find that was “yellow” so it would match the color scheme of this build which is built in the Corsair Carbide SPEC-04 Mid Tower ATX case. 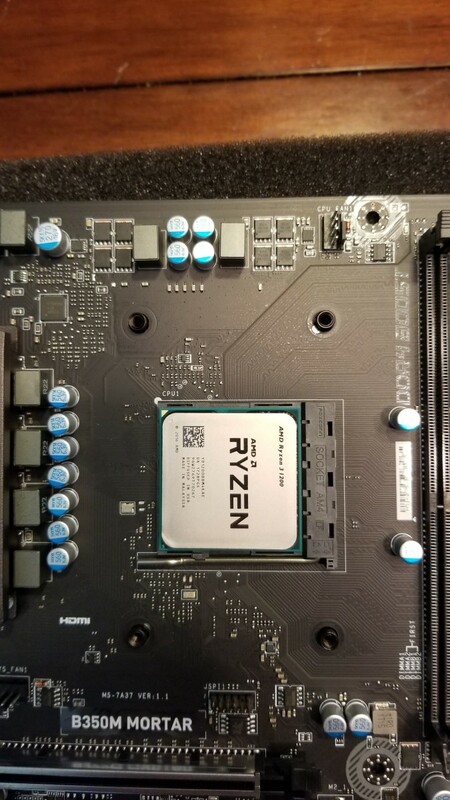 The RAM works as specified and runs just fine on the MSI Mortar MicroATX motherboard and the Ryzen 3 platform. 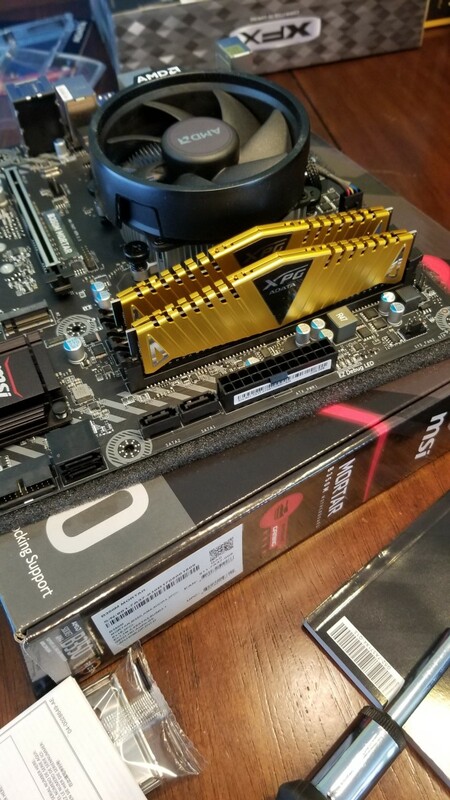 The RAM heatsinks are more of a gold color than yellow but still looks great in this system and matches the color scheme perfectly. There’s really nothing more to say about this RAM except that it has a really good price to performance ratio as I only paid around $60 for a pair of 4GB modules. 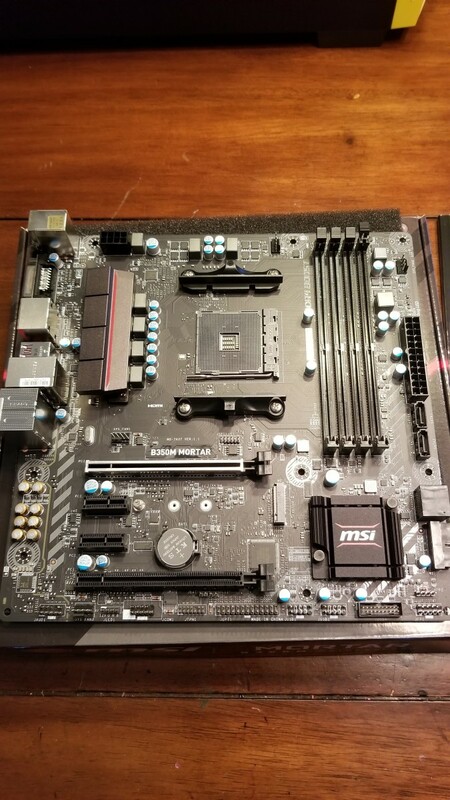 The motherboard in this build is the MSI B350 Mortar microATX motherboard. This motherboard sports the AM4 socket which supports Ryzen series processors and 7th generation A-series and AthlonTM processors. 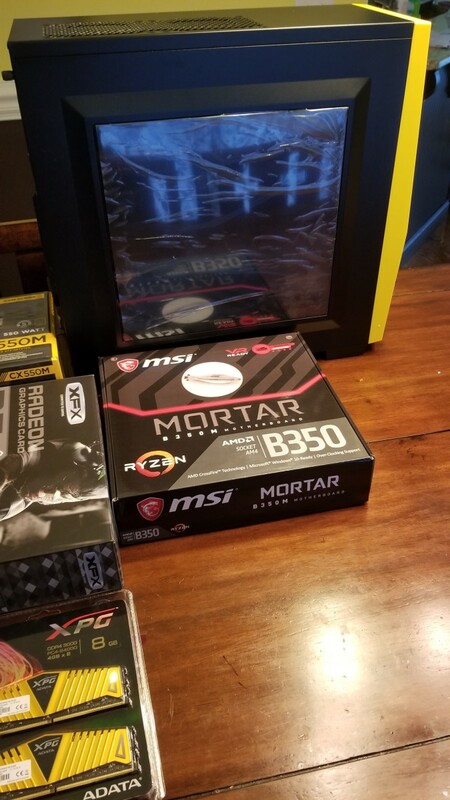 The MSI B350 Mortar supports DDR4 RAM up to 3200+ speeds and has 4 DIMM slots to support up to 64GB of memory. There are 2 PCI-EX16 slots, 2 PCI-EX1 slots, 4 SATAIII ports, and 1 M.2 slot. Also included on this board are 4 USB 3.1 Gen1, Type A ports in the front and 3 USB 3.1 ports in the rear. Along with those ports, there are 4 USB 2.0 ports in the front, 2 USB 2.0 ports in the rear, and 1 serial port in the front. 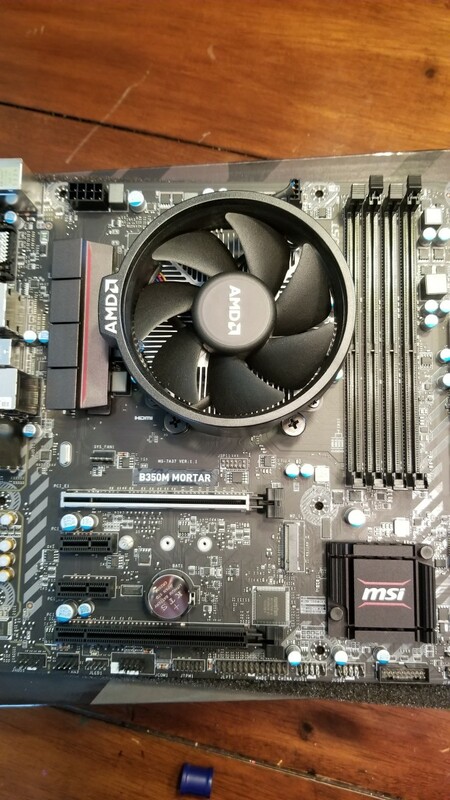 This motherboard supports AMD Crossfire and has 3 x 4-pin system fan connectors, and a 4-pin CPU fan connector, giving plenty of options for cooling for the components most people would use with this motherboard. The video card that was purchased for this system was a very inexepnsive GPU that I found for a pretty amazing deal on newegg. I purchased the Radeon R7 360, 2GB GPU. The GPU is built on the 28nm architecture and supports DirectX12, OpenGL 4.5, Vulkan, Mantle, and OpenCL 2.0. The GPU core clock speed up to 1000MHz and a memory bandwidth up to 112GB/s. 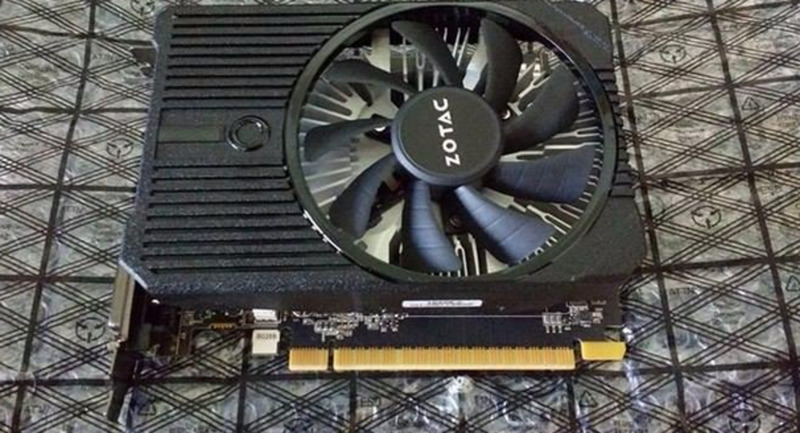 There is 2GB of 128-bit GDDR5 VRAM and comes with 768 stream processing units. 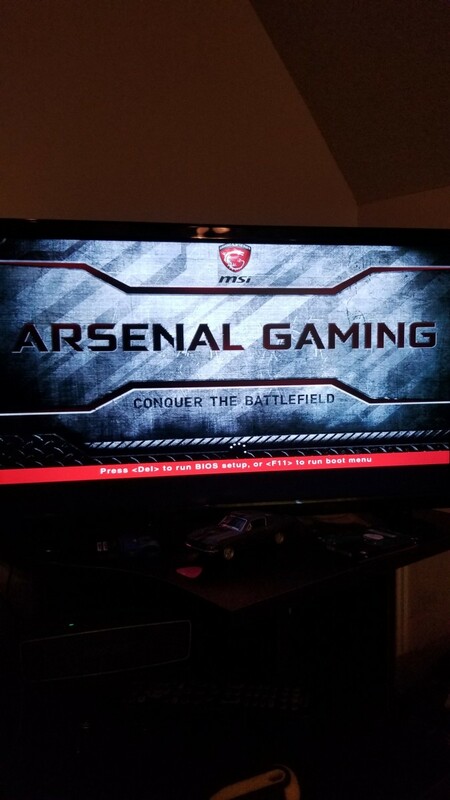 It supports Crossfire setup and is powered by a single 6-pin connector. 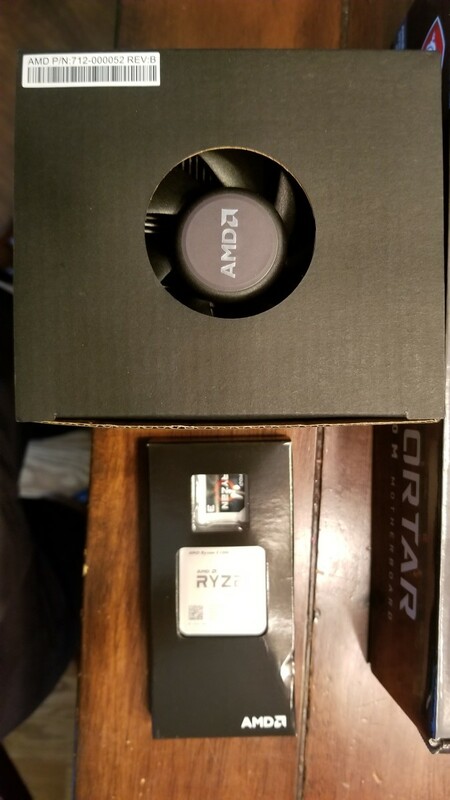 This GPU should be just fine with the Ryzen 3 1200 to run games like Minecraft and Roblox which are the primary games my daughter will be playing. However, I will consider upgrading this component in the future if she does indeed decide to get into Destiny 2 to play with me, in which case, this GPU would not do well with the game and I would consider a GTX 1050ti, GTX 1060 3GB model, or an RX 570/580. 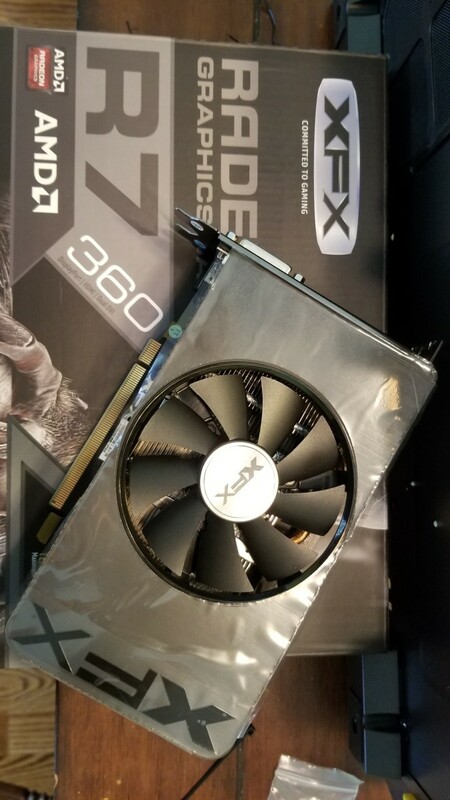 Overall, this GPU is a perfect budget fit for this system and for the $40 final price (after sale and $30 rebate) paid for this GPU makes it quite a steal. 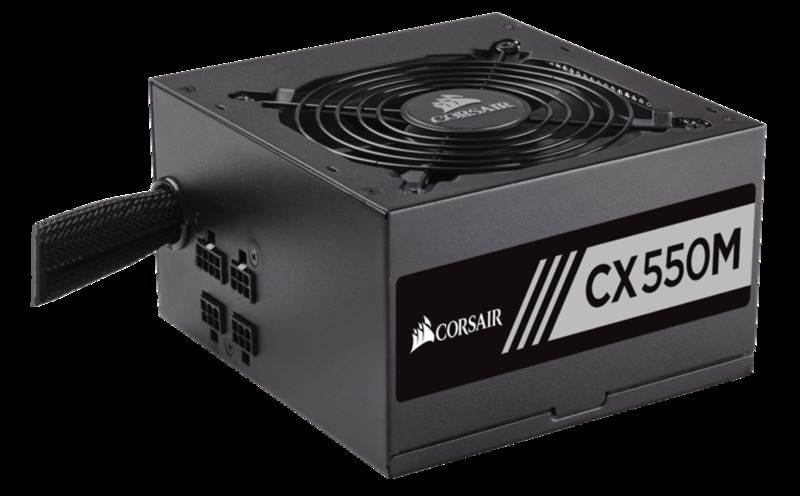 Powering this system is the Corsair CX550M, 80+ Bronze certified, semi-modular power supply in ATX format. I purchased this power supply at Bestbuy for around $50 on sale. This is more than enough power to power this system with any Ryzen processor and even upgrading components to a 1080ti in the future if we desire to do so. There’s really nothing more to say about this power supply as it is a perfect fit for this system. 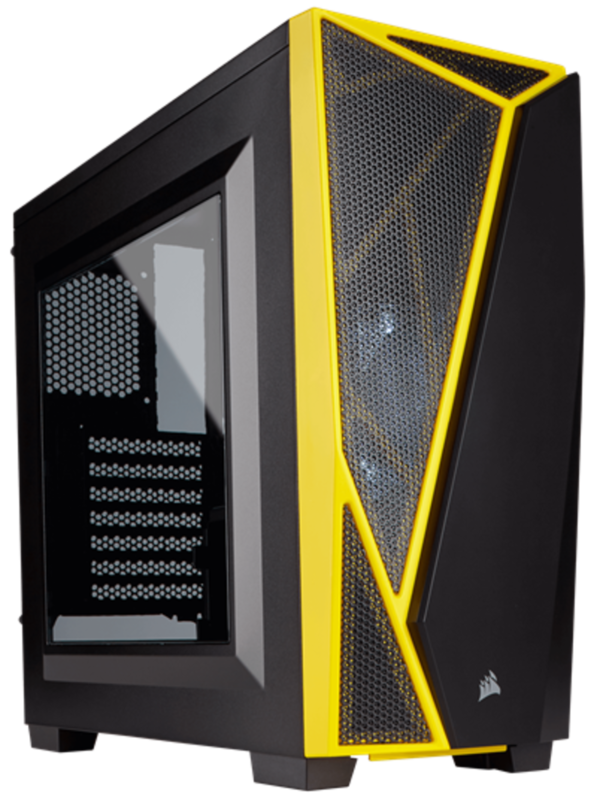 The case housing this system is the Corsair Carbide SPEC-04 black and yellow case. The case supports up to 3 mechanical hard disk drives and 2 solid state drives. There are plenty of cable routing cutouts and tie downs to make cable management fairly easy. There are removable, built-in dust filters to help keep your components dust-free. And with room for up to 5 120mm fans, cooling is not an issue; case comes with a single 120mm white LED fan preinstalled in the front of the case. 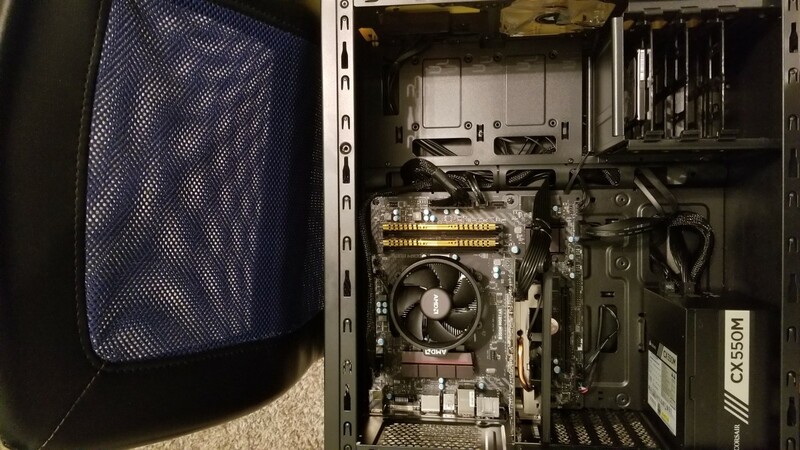 I purchased this case directly from Corsair’s website for around $60 after shipping and handling. This case is definitely worth the $60 (I would pay up to around $75) given the styling, clean modern look, and ease of building. It was an absolute joy to build in this case. 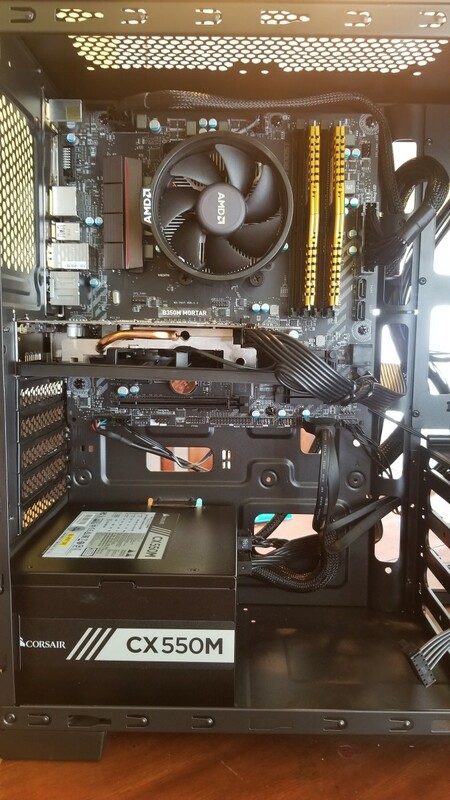 This computer is a budget gaming PC that is sneaky good and has specs to compete with some more expensive computers with “higher end” components. This was an absolute joy to build and I look forward to the small upgrades that I hope to make in the future. 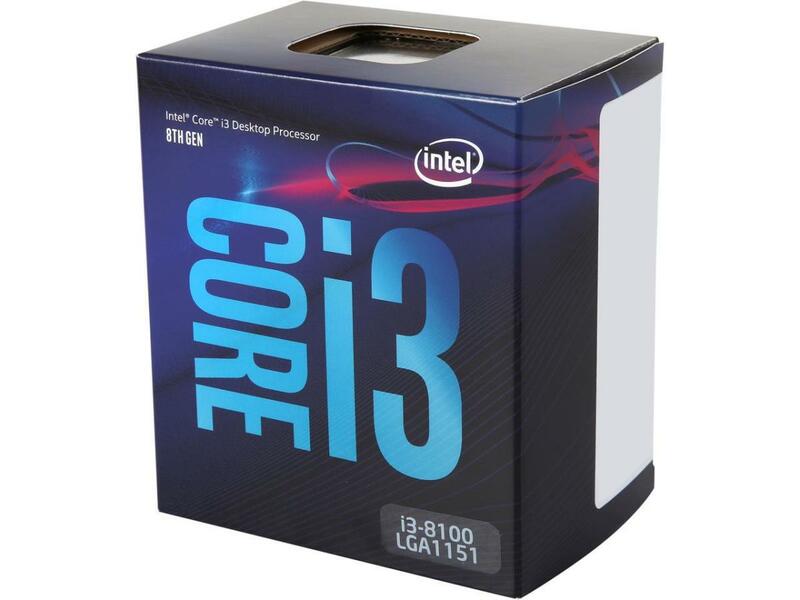 Fantastic bang for your buck, that’s for sure and price to performance is perfect.